Inspired by a classic French mayonnaise called sauce gribiche, this salsa verde combines hard-cooked eggs with capers and delicate fresh herbs (parsley, chives, and tarragon or chervil). The result is a bright and savory dressing to complement the bitter escarole without overpowering it. The salsa should not be made ahead because the acid will dull the herbs. With a mortar and pestle (or using the side of a chef’s knife), mash the garlic to a smooth paste with a pinch of salt. Combine the garlic paste with the shallot, vinegar, and mustard in a small bowl. Let sit for 5 to 10 minutes. In a medium bowl, combine the herbs, 1/2 cup of the olive oil, and the capers. Stir the shallot mixture into the herb mixture. Chop the egg (or mash it in a bowl) and gently stir it into the salsa. If you’d like the salsa to be looser, add more oil. Season to taste with more salt or vinegar if necessary. Put the escarole on a baking sheet, drizzle with the remaining 3 Tbs. of olive oil, toss gently to coat evenly, and season with salt. 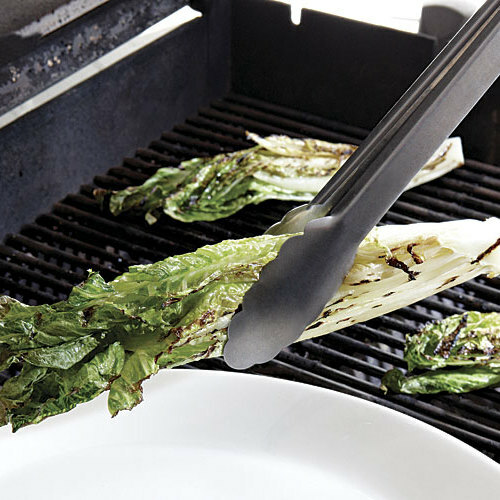 Place the escarole on the grill cut side down and grill until nicely marked, 1 to 2 minutes. Turn and mark on the other cut sides, 1 to 2 minutes more. 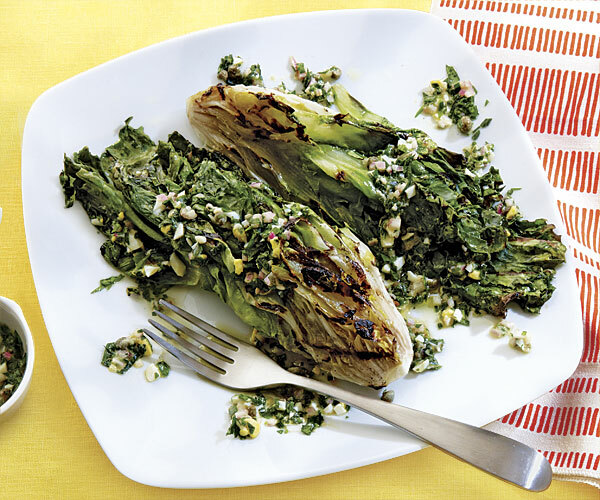 Transfer the grilled escarole to a platter or individual plates, and spoon some of the salsa on top. Serve immediately, passing any remaining salsa at the table. Made this twice for guests. A huge hit.